There are no messages on ken.gervais89's profile yet. 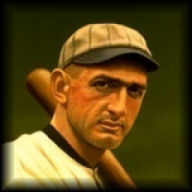 For anyone interested, my avatar picture is that of Shoeless Joe Jackson (who's swing was so sweet, that Babe Ruth freely admitted copying it), who I think was screwed by the then commissioner of baseball, Judge Landis. Jackson belongs along side such greats as Babe Ruth, Lou Gehrig, Cy Young, and a great many others, to be inducted into the Baseball Hall of Fame. Even though Joe Jackson was cleared of any wrong-doing in a civil court, MLB and Judge Landis (and his petty ignorance) decided otherwise. Joe Jackson belongs in the Baseball Hall of Fame, unlike, as a result of a total miscarriage of justice, Judge Kenesaw Mountain Landis, who did nothing to advance the game of baseball, unless turning a blind eye to the facts in front of him counts, was voted into the Baseball Hall of Fame, thanks to a "special vote" after his death in 1944. One day a great wrong will be righted and Joe Jackson will be a member of the Baseball Hall of Fame. I can only hope that I'm around when it happens.